I awoke to the sound of the coffee grinder. Still dark. Where's my stuff? Where's the door? Packed a lunch and we're off. Through the fog and darkness, as the caffein kicked in the stories began to flow. "Over here there's a hole, up there has been hammered, all wilderness up that drainage, etc etc"
We pulled up on a bluff overlooking the river shortly after sunrise. A mist hung along the forested slopes, not a soul around. We grabbed our gear and set off down the hill. "Poison oak." "Watch the toads." "A bear was here." "Deer tracks." We tied on our lures, and started fishing. Easy enough, cast, sink, retrieve, work that riffle, ready for action. Then, "whoa!" "Got something here!" A steelhead! Like an excited kid I landed the fish and posed for the trophy photo. This is a hatchery steelhead, identifiable by the clipped "adipose" fin on the spine. Hatchery fish are legal for harvest, so this one was destined to return home with me. We fished for another hour, without luck, and then hiked back up the hill. After buying some ice to keep my souvenir fresh, we drove upstream. 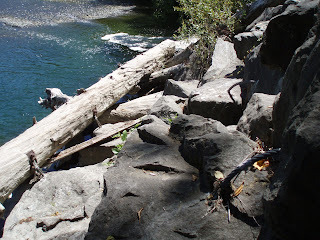 The river here is wild and free-flowing, with large meanders, pools, and riffles. Driving onward, we parked at a well used pullout and gathered our gear. "Bring the snorkeling stuff this time." Hiking down a steep trail, we gained glimpses of the river below. We arrived at a large, deep pool, which looked promising. Over the next hour, many fish rose to the surface, lures were cast, but nothing. We hiked down to another pool, same results. "OK. Let's see what we missed." "Yea, right," I thought, "there's no fish in here." We donned our mask and snorkel, and slipped into the surprisingly warm water. As I expected, nothing, just cool clear water and a deep pool next to the cliffs. Then, as I led the way through the tail end of the pool, several schools of a dozen or more steelhead flashed past me. "You see that?" "Yahoo!" I have been diving in the ocean for 30 years, but until this I had never even considered using a mask in a river. This was a whole new world! But the best was yet to come. We dropped into the rapidly flowing river below the first pool, getting whisked downstream in the flow. Several more steelhead flashed past, spooked from their resting place in an eddy. 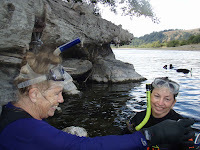 As we entered the lower pool, I dived down deep into clean, clear water about 25 feet deep. As I reached the bottom, still rushing along in the current, another school of steelhead, then a school of silver Chinook, unmistakably different even to a neophyte. Wow! One was way bigger than the rest, perhaps a 40 or 50 pounder. Look what we missed! We returned to town with only one fish to show for our efforts. But as I thought about it, that steelhead was truly a gift from the river. And it made my trip all worthwhile. Many thanks to the people who made this possible! It was fitting that as part of my introduction to the salmon rivers of northern California, I was destined to visit the Klamath River. The Klamath is notorious for the devastating fish kill of 2002, when over 30,000 adult Chinook salmon fell victim to upstream water diversions. At first light we took a small drift boat to the mouth of what was once the third most productive salmon river in the nation. 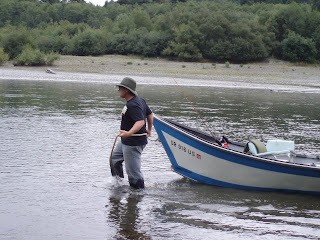 Here, native Americans have permits to fish the estuary using gillnets. The scene reminded me of the local fishermen I have observed in Baja California. It's good to see there was still some commercial catch available to the local tribes. 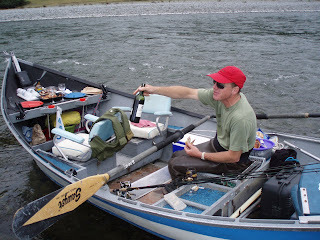 After a couple of hours trolling, it was clear the fish were not interested in our shiny metal lures, so we took the boat upstream. Here we rowed upriver for an hour, walking and casting along the bank for the final half mile or so. Bear tracks on the riverbank served as a reminder of the relatively wild ecosystem, and there was "Large Woody Debris" of a scale not found in Southern California. "Pop!" The sound echoing up the river had us running for the boat. Lunch was served, with a nice bottle of wine. Top notch guide service! Algae has been a topic of interest since we started monitoring on the Ventura River. Here on the Klamath algae is largely the result of the upstream dams. In a complex reaction that highlights a delicate cause and effect balance, the dams heat the water and accumulate nutrients from farming. The release of this toxic soup downstream dramatically alters the ecosystem. 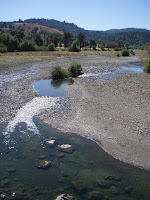 This photo shows typical algae growth in the lower Klamath River. As the sun came out in the afternoon, we measured water temperatures over 71F and levels of dissolved oxygen over 9 mg/l, a recipe for stress later in the evening when the plants cease photosynthesis. "Come up to the north coast sometime and we'll catch a steelhead." This offer was made at a fisheries conference a couple of years ago when I mentioned that I had spent 15 years on steelhead restoration, but never had a chance to fish for them, as they are now endangered in Southern California. When I learned of the "Coho Confab" to be held on the Mattole watershed in Humboldt County on Aug 17-19, the lure of steelhead was in the back of my mind. So last weekend I made the long drive up north to attend the conference, with a couple of days on the tail end reserved for fishing. In many respects, the Mattole is where it all began. Much has been written about the struggle of the Headwaters Forest and plight of the salmon in this watershed. This is where Julia Butterfly made global headlines with her epic tree sit. And where 30 years of restoration has made marginal gains in an ecosystem fatally damaged by clear-cut logging. It was a place I had heard so much about, and this was an opportunity to learn from those who had been doing the work for half their lives. The loss of the old growth resulted in severe soil erosion throughout the 300 sq mile watershed, which in turn led to dramatic changes in the river and tributary creeks. 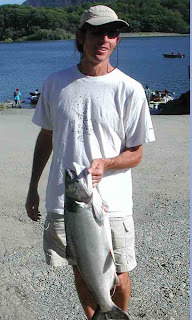 Fine silt and sand has filled in the pools which once produced an endless bounty of Chinook, Coho, and Steelhead. Cold water that once flowed out of the deep shade of the redwood forest has diminished, leaving just a warm trickle. In 1978, residents within the Mattole River basin began proactive restoration efforts aimed at increasing salmon numbers. It quickly became apparent, however, that salmon do not live just in streams, they live in watersheds. In order to save the native salmon runs, residents began to consider how to care for the whole system. Early work included salmon rescue and evolved into reforestation. This led to the formation of the Mattole Watershed Salmon Support Group (MWSSG) in 1980. Slowly an industry was formed around the restoration activities, and money was raised to plant trees, raise salmon, and educate the community. Over the weekend, a series of field tours were conducted with visits to restoration sites and hands-on workshops to fast-track the learning experience. During one such tour we visited this example of an innovative bank stabilization project, quite different from the concrete structures that we live with in SoCal. 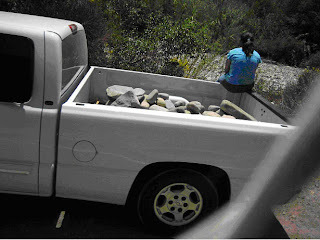 Look closely and you can see that each rock is cabled to the next using a drill and epoxy. Also notice the shade, and the vegetation emerging between the rocks. This structure has endured flows over 40,000 cfs, equivalent to a large flood on the Ventura River. One of the benefits of this project is the deep scour pool formed under the log. Sedimentation has made deep pools like this rare in the lower river. Projects that help protect the streambank, as well as create deep pools and riparian cover, are seen as one strategy to increase rearing habitat for juvenile salmonids. We returned to this same site in the afternoon for the "Tails of a Hidden World" workshop. Donning our wetuits and snorkling gear, we swam with an estimated 1,000 steelhead smolt, with a few chinook smolt in the mix. 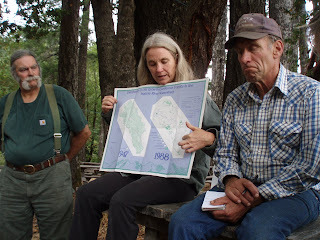 It is important to note that the Mattole Restoration Council recognized early on that restoring a watershed meant much more than instream structures and salmon. Building a community around the restoration ethic has been central to the effort. And building community was all about gathering to share experiences and have fun. Usually, environmentalists cheer proposals to conserve drinking water. But an idea the city of Ventura is examining to use treated sewage water from the Ventura River has some worried the move aiming to help the environment could hurt it. "Normally, the idea of recycling water is really a good one," said Russ Baggerly, director of the Ojai Valley Sanitation District. "In this instance, I don't think it's a good idea." The city is considering replacing drinkable water it sells to oil companies with treated sewage water, which comes out of the Ojai Valley sewer plant and flows down the Ventura River. The plan, which is in the early exploratory stage, calls for about half ­ or 1,000 acre-feet ­ of the water the sewer plant puts into the river to be diverted to oil companies. The companies currently use treated, drinkable water to force oil out of the earth. Karen Waln, a management analyst with Ventura, said the city is always looking for ways to use recycled water instead of potable water to cut costs and help the environment. The city spent $75,000 on the recently released draft plan; the state, which encourages recycled water projects, gave another $75,000. "It's a lot more acceptable to use reclaimed water than treated," Waln said. But Baggerly said he believes taking that much water out of the river could hurt its ecological balance, potentially disturbing the federally endangered steelhead trout. Much has been done to try to re-establish the fish in the river, including building a $9 million fish ladder that allows them to swim around the Robles Diversion, which sends water to Lake Casitas. 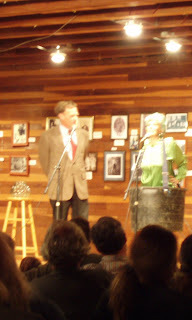 Baggerly is also the chairman of the Casitas Municipal Water District Board of Directors, which paid for the ladder. "We already spent millions of dollars to try to rehabilitate the habitat in the Ventura River," he said. "Now we are thinking about taking more than half of that water away?" But Waln pointed to the draft report, which says the effects of taking that water can be mitigated and likely won't have an adverse effect. Ultimately, the city could move forward even if the sanitation district opposes the project. It owns the water that comes out of the sewage plant and leases the property to the district. On behalf of the Matilija Coalition, I have reviewed the Ojai Valley Sanitary District (OVSD) Effluent Reuse Feasibility Study and have the following comments. We commend the City of Ventura for seeking alternative water strategies to optimize beneficial use of our limited water supplies. Replacing the current use of potable water for oil reclamation with reclaimed water has merit. However, we cannot support the reuse of Ojai Sanitary effluent as currently proposed in the feasibility study. Accounting for the proposed 1000 acre-ft/year reduction in effluent discharge, produces a flow-duration curve that suggests that no flow would reach the mouth of the estuary approximately 25-percent of the time when water rights are being implemented in full. We are concerned that the proposal to remove up to 50% of the flow from the lower river will have an adverse impact on the ecosystem. Indeed, improvements to the wastewater treatment system were funded with the understanding that the enhanced effluent would provide for sensitive in-stream habitat. Although there may be some water quality benefits from the proposal, any scheme to reuse this effluent should include assurances that there is no net loss of in-stream flow. We recommend that opportunities for water reuse and conservation be developed within a watershed context. A comprehensive multi-agency water supply and demand budget should be conducted for the entire watershed in order to identify areas where such strategies may be best applied for the greatest overall ecosystem benefits. "California Ag Leadership Program organizes an annual DC Exchange Program where policy makers from Washington are toured for a week in California agriculture and exposed to regional issues. Of the 20 persons selected by Alumni interviews in Washington there are included A Senior Scientist and Technology Manager of Interior's U.S Fish and Wildlife Service, Other Interior, USDA, EPA and Congressional appropriations staff." I was privileged to make a 20 minute presentation on the Matilija Dam removal. Other presenters spoke about United and the Freeman Diversion, the chloride contamination of the Santa Clara River and the Ag Waiver non-point source runoff regulations. Upon request, I am sending an information packet including my powerpoint presentation, videos, and newsletters to a staff member U.S. House of Representatives, Committee on Appropriations. July 31, 2007 - Matilija Creek below Matilija Dam – Recent grading of shoulder along Matilija Canyon Road, downstream of Stream Team Site 13. Vegetation and sediment pushed over edge of road. New wide shoulder creates opportunity for parking and dumping.